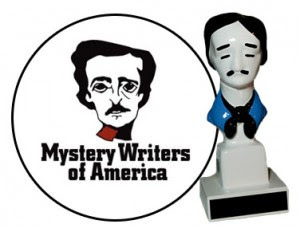 Mystery Writers of America have announced the winners of the 2017 Edgar Allan Poe Awards, honoring the best in mystery fiction, non-fiction and television published or produced in 2016. The awards were presented on April 27 in New York City. ‘Best Fact Crime’ is a disturbing title for an award. I’m having difficulty finding what the named awards are for. Does anyone know? “Max Allen Collins Ellen Hart” are in fact two people. tigerb: Thanks for catching that — appertain yourself your favorite beverage! “Charles Todd” is a pseudonym, for 2 people, a man and a woman, as I recall. The winner will be selected by a Special MWA Committee for the book most closely written in the Mary Higgins Clark Tradition according to guidelines set forth by Mary Higgins Clark. The protagonist is a nice young woman whose life is suddenly invaded. She’s self-made and independent, with primarily good family relationships. She is not looking for trouble–she is doing exactly what she should be doing and something cuts across her bow. She solves her problem by her own courage and intelligence. Heaven help us! And there are enough stories that fit that description that it makes sense to run an award for them? I’m now wondering what the SF equivalent might be, but I can’t think of anything nearly as detailed.